Fairtrade drinks and Snacks on the go! for Fairtrade drinks and snacks on the go! Offering London commuters an easy way to grab their coffees, teas, chocolates, cold drinks and snacks on the go! We have a huge selection of Fairtrade drinks including coffee, tea, chocolate and cold drinks, plus, we have a range of freshly baked pastries and snacks to keep you going all day long. Check out our locations across London. If you are interested in having a TAKE 5 Kiosk in a location near you, then contact us for more information. 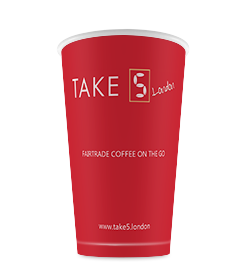 TAKE 5 have a range of opportunities to allow you to offer your visitors fresh, Fairtrade hot and cold drinks.